The Japanese Pharmacopoeia defines byakujutsu (Atractylodes rhizome) as the rhizome of Atractylodes japonica or A. macrocephala and sojutsu (Atractylodes lancea rhizome) as the rhizome of A. lancea, A. chinensis, or their interspecific hybrids. Because their pharmaceutical uses differ in traditional Japanese Kampo medicine and traditional Chinese medicine, with less apparent scientific evidence, we compared the pharmacological properties between byakujutsu and sojutsu. Crude drug specimens of byakujutsu (n = 40) and sojutsu (n = 49) obtained in markets were identified by their species using DNA profiling. Their pharmacological properties were evaluated by the inhibitory effect of a MeOH extract of the samples on nitric oxide (NO) production by lipopolysaccharide-stimulated murine macrophage-like RAW264.7 cells and by the inducing effect of boiling water extract of the samples on granulocyte-colony stimulating factor (G-CSF) secretion from murine normal colonic epithelial MCE301 cells. We authenticated A. macrocephala (n = 8), A. japonica (n = 35), and the hybrid between A. macrocephala and A. japonica (n = 1), and they were used as byakujutsu. We authenticated A. chinensis (n = 25), A. lancea (n = 14), and the hybrid between A. chinensis and A. lancea (n = 6), and they were used as sojutsu. The inhibitory effects of byakujutsu on NO production were significantly higher than those of sojutsu (P < 0.05). This activity of A. japonica rhizome was significantly higher than that of A. macrocephala rhizome and A. lancea rhizome (P < 0.01). The activity of A. chinensis rhizome was significantly higher than that of A. lancea rhizome (P < 0.05). The extract of A. japonica rhizome significantly induced G-CSF secretion from MCE301 cells in a concentration-dependent manner. These effects of byakujutsu samples were not significantly different from those of sojutsu samples. A. japonica rhizome had significantly higher activity than A. macrocephala rhizome; however, there were no statistically significant differences among A. japonica, A. chinensis, and A. lancea. 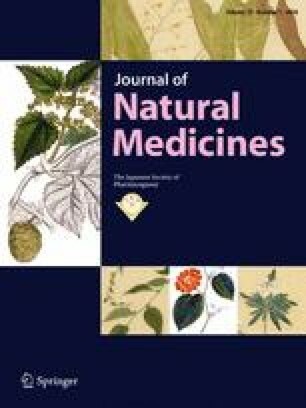 The pharmacological differences of byakujutsu and sojutsu may not be large among highly variated crude drug samples with average values, and quality control with the identification of the original plant species of byakujutsu and sojutsu may guarantee their pharmacological properties.